One of the most important steps in photovoltaic devices is photoinduced electron transfer (PIET). Such materials as derivatives of fullerenes, porphyrins and (doped) polycyclic aromatic hydrocarbons (PAHs) can be used in organic solar cells and to mimic natural photosynthesis. We have used our own (semiempirical UNO–CI) and DFT methods to explain experimentally observed phenomena. Our calculations elucidated the nature of the charge transfer band observed in UV-vis absorption spectra in donor-acceptor conjugates built of fullerene C60 as electron acceptor and free base and zinc porphyrin as electron donor and in dumbbell-type donor-acceptor conjugates built of C60 (acceptor) and benzodifurane (donor). We have also suggested new candidates for PIET based on doped PAHs and C60 and porphin and predicted interesting properties of this complexes, e.g. 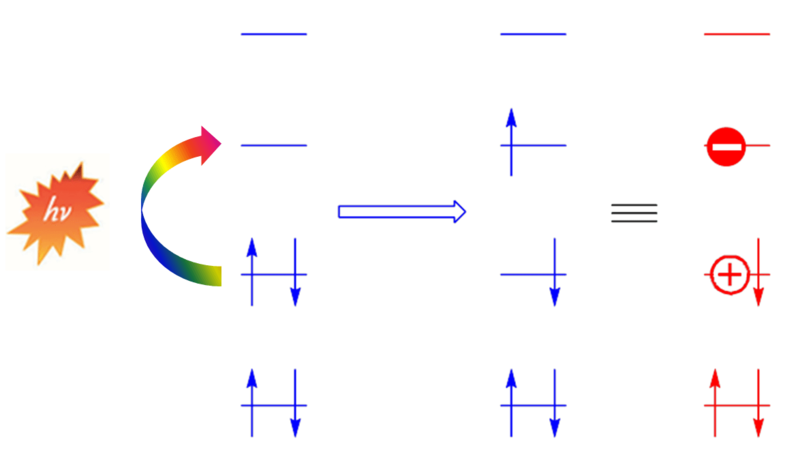 change of direction of charge transfer upon change of environment. 3. Hui Li, Christina Schubert, Pavlo O. Dral, Rubén Costa, Andrea La Rosa, Jürg Thüring, Shi-Xia Liu, Chenyi Yi, Salvatorre Filippone, Nazario Martin, Silvio Decurtins, Timothy Clark, Dirk M. Guldi, Probing Charge Transfer in Benzodifuran–C60 Dumbbell-Type Electron Donor–Acceptor Conjugates: Ground- and Excited-State Assays. ChemPhysChem 2013, 14, 2910–2919. DOI: 10.1002/cphc.201300378. 2. Pavlo O. Dral, Milan Kivala, Timothy Clark, Doped Polycyclic Aromatic Hydrocarbons as Building Blocks for Nanoelectronics: A Theoretical Study. J. Org. Chem. 2013, 78, 1894–1902. DOI: 10.1021/jo3018395. 1. Alina Ciammaichella, Pavlo O. Dral, Timothy Clark, Pietro Tagliatesta, Michael Sekita, Dirk M. Guldi, A π-Stacked Porphyrin–Fullerene Electron Donor–Acceptor Conjugate that Features a Surprising Frozen Geometry. Chem. Eur. J. 2012, 18, 14008–14016. DOI: 10.1002/chem.201202245.